Courage Campaign | SIGN THE PLEDGE: Boycott El Super! SIGN THE PLEDGE: Boycott El Super! My name is Fermín Rodríguez and I was terminated from El Super -- a California-based, Mexican owned supermarket chain where I worked for 9 years. The offense? Standing up for what's right. Fighting for a better life for myself, my family, and my coworkers. We have been working without a union contract since September of 2013, and El Super has refused to negotiate with us for more than a year. The company even tried to take away our union representation. In December of last year, we decided to launch a boycott to protest unfair labor practices at our stores, and today is an international day of action to support El Super workers. The National Labor Relations Board announced it was seeking a rare injunction that could force the company to restore benefits and reinstate me to my position, so I can walk alongside my co workers, and return to the bargaining table. But this fight is about more than my illegal firing: it's about respect for all workers and basic protections on the job. The ability to take sick leave when we or a family member is ill; a fair wage that reflects our contribution to the company’s giant profits; and guaranteed full-time hours for those willing to work. We need to show El Super and their parent company -- Grupo Chedraui, the third largest grocery chain in Mexico -- that we will not stand for its illegal and intimidating tactics. I'm pledging my support for workers of the El Super chain of supermarkets, and will boycott all locations until their workers are treated with respect and earn enough money to provide the basics for their families. 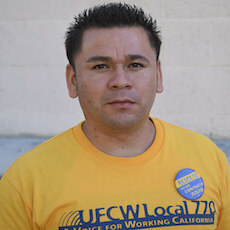 The NLRB is seeking a rare injunction against El Super to stop its illegal coercion and silence workers -- including the unfair termination of union activist Fermín Rodríguez. I urge El Super and its parent company to reinstate Rodriguez, restore all lost benefits, and bargain with the union in good faith. We demand that El Super management in the US and Mexico respect workers’ rights.